This month, Sensei started giving me a set of biopsy slides to interpret and diagnose on my own then compare my diagnosis with his. I get most of the diagnoses correct but there are cases that I really do not know and are new to me. This month it is my first time to come across granular cell tumor with its pustulo-ovoid bodies of Milian, to find out what an infarcted fibroepithelial polyp looks like, to see a tophus, to know if the lesions are scratched, to differentiate between trichoepithelioma, trichoblastoma and trichofolliculoma, to see what spiradenoma and cylindroma look like, to know the history of how a pilomatricoma is formed and so much more. So, I have to learn and read more slides and books. I was used to talking to my dad about my thoughts and adventures but here in Japan I have to talk myself out. I sometimes assure myself of the reason I am here. It is because I don’t know and I want to learn more knowledge. It seems like there a lot to know and to explore. I was an archer in the past and archery is still a part of me even with the way I handle situations in my life. “Aiming” to the target is like aiming to achieve my goal of becoming a good dermatopathologist. “Focussing” on the bullseye is like studying and working hard to hit the correct diagnosis. Then “shooting” an arrow is like trying to test myself and how much knowledge I have gained in my studies. I think I am in this level right now with “diagnosis and interpretation”. Hitting the bullseye is like having the same diagnosis as sensei’s. If I hit the bullseye then it’s good. I’ll be happy. If I miss the bullseye then I have to evaluate myself and ask myself where did I go wrong then learn from it and move on. So, back to archery, I was amazed to know that there is a thing called “Hamaya” in Shinto shrine. It is an arrow that should be placed inside the car to protect the driver and the passengers from car accident. I wanted to buy one and bring it home to the Philippines but it’s expensive for me so I settled down with “Ema” because it is cheaper and looks like a “target face” in archery. In archery, in life, in dermatopathology -- Aim, focus, shoot, follow through. Diagnosis and interpretation continued this month. Honing my skill in making a diagnosis. 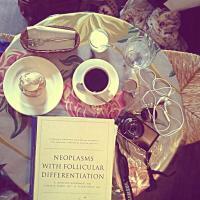 Apart from this, I focused myself on hairs and read the “Histopathologic Diagnosis of Adnexal Epithelial Neoplasms: Atlas and text” and “Neoplasms with Follicular differentiation” both by A. Bernard Ackerman. 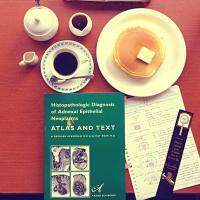 What I love here in “Sapporo Dermatopathology Institute” is the complete collection of books especially books by A.B. Ackerman. I am not yet done reading it but I hope to finish it by June. Cherry trees started to bloom this month. I am so happy to see it for the first time and I will forever cherish this experience. I biked around Hokkaido University everyday just to see Cherry blossoms. We also went to Maruyama Park on the weekend and had picnic under the cherry tree. What a great experience. Riesye Arisanty / Mei in Sapporo..
Cherry blossom time..... Finally i can see the famous sakura tree.. wow, it’s really amazing.. so beautifull, subhanalloh.. We have a 花見 to see the cherry blossom at maruyama park, the best place to see it.. So many flowers, with so many colour all over sapporo, it makes sapporo more beautifull to see.. i thing i will really missed this city when i go back to Indonesia.. I will remember all what dr. Kimura teach us about dermatopathology, it will be my valuable knowledge to be a dermatopathology in jakarta..
My writing project still on progress. Starting from collecting all data from clinical data and microscopic data, when it’s done, i try to conclude all findings into one paper report.. to be honest, writing paper is not my strength, but i will tried to do my best. Weather in sapporo is so nice, not so cold because it’s a spring already.. and i really waiting to walk around to see the beautiful of cherry blossom tree..